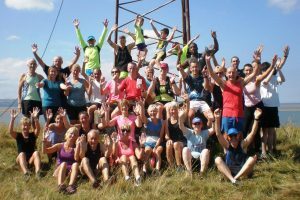 Hilbre Island Run Sunday 5th August 2018. 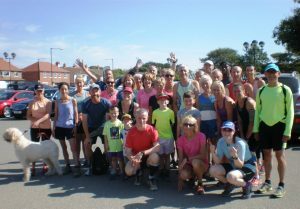 The second “Run and Swim” this year took place on Sunday, 5th August to take advantage of the low tide that day. The weather was very warm and very sunny. As previously, there were three run options – a 7.2 mile run (5 miles out to the main island and 2 miles back); a 5-mile run (3 miles out to the main island 2 miles back) and a 4 mile run (2 miles out to the main island and 2 miles back). Due to family holidays, numbers were slightly down on our June excursion but nevertheless, 37 plus one dog completed the run, and 22 joined in the swim. Nine members completed various pre-Chester Marathon distances of 5, 8 or 10 miles, prior to the event. 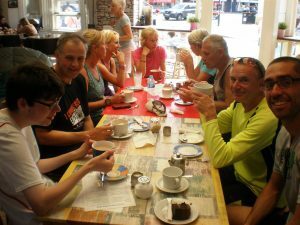 We finished off with coffee at the Lattetude Cafe in Dee Lane. Hopefully we will have another in 2019. (Report and photos from Ian Chalmers – and from the club, another big thank you to Ian for once again being the organiser of what was a highly enjoyable and very well run event).